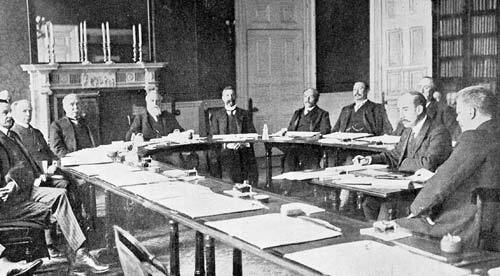 Colonial leaders met in London in 1907 to discuss a broad range of matters – from left, New Zealand's Joseph Ward, Canada's Wilfrid Laurier, Britain's Henry Campbell-Bannerman, British Secretary of State for the Colonies Lord Elgin, Australian Prime Minister Alfred Deakin, Cape Colony Prime Minister Leander Starr Jameson, Transvaal Prime Minister Louis Botha and Australian Minister for Trade and Customs William Lyne. They discussed defence, trade, migration, naturalisation, judicial systems, acceptance of qualifications granted in other parts of the empire, taxation, fisheries, post and telegraph communications, British interests in the Pacific, labour laws, transport, African colonial federation, financial matters and treaty-making. At this meeting it was decided that the self-governing colonies would be called dominions, and the conference the Imperial Conference.